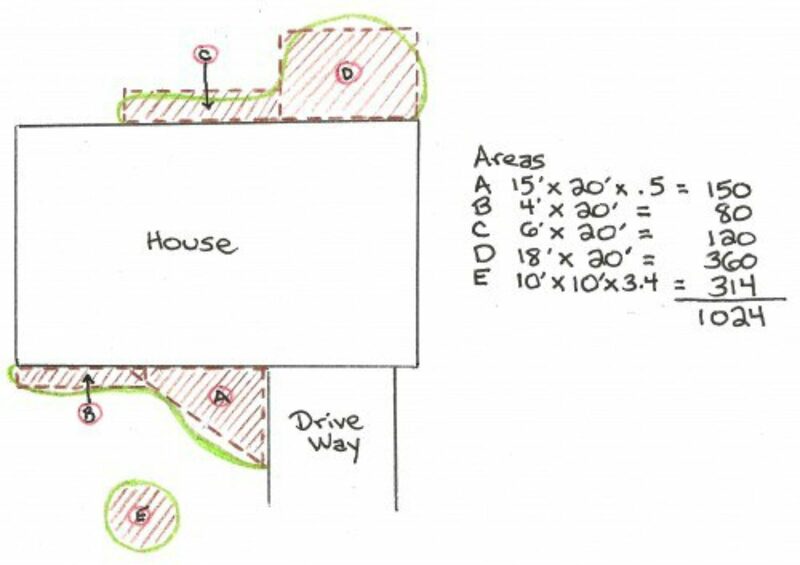 For estimating quantity needed for irregular areas break the area up into smaller workable shapes. Measure each of them and assign them a letter. Calculate square feet for each and add the square footage together to figure total needed. Example: A rectangular area 16 feet long by 10 feet wide and you want 4 inches deep of stone. Converts square feet to cubic yards 1 cubic yard will cover the following amount of square feet at the given depth. Stone less than 1" diameter 3"
Soil for Lush Lawns 4+"
Garden Soil in Flower Beds 6-12"
There are 54 50lb bags of stone or sand per cubic yard. 27 cubic feet equal 1 cubic yard (3'L x 3'W x 3'H). Soil weighs about 2,200 lbs per cubic yard. Stone weighs about 2,700 lbs per cubic yard. Mulch weighs 250-750 lbs per cubic yard. Full size pick-up with 8’ box a heaping load is 3 cubic yards. Small size pick-up heaping load is 1 ½ cubic yards. 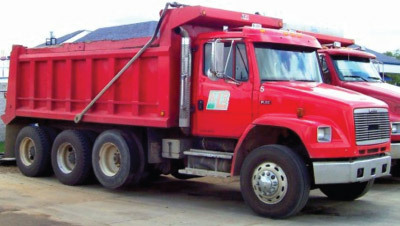 Typically a full size truck can take ½ - 1 cubic yard stone or soil. Typically a small pickup truck can take ⅓ - ½ cubic yard stone or soil. 7 to 12 wheel barrow loads in 1 cubic yard. When topdressing previously mulched beds you only need to add enough mulch to existing bed to get a total of 3". Installing less than the recommended amounts of stone can result in OK short term appearance but after a few years the stones somehow disappear and the ground reappears. Try to make an educated guess of quantity needed using the formulas. If you are still unsure how much bagged or bulk material to get provide the measurements to the KLS staff and they can help you estimate. There are 54 bags of stone or soil per 1 cubic yard. There are 27 1 cubic foot bags or 18 1.5 cubic foot bags of mulch per yard. Consider a ½ cubic foot bag of stone or soil weighs about 50 lbs and will cover 2 square feet at 3" deep. A bag of hardwood or cedar bark contains about 1 cubic foot of material, enough to cover about 4 square feet at 3" deep. If you have large areas you probably need bulk. A less expensive alternative to buying in bags is to bring in and fill up your own containers with bulk materials. If you are dressing up a small area maybe bags are best if you do not have a way to haul bulk material. Mulch purchased by the bag is about 2 or 3 times more costly than bulk. Stone purchased by the bag is about 3 or 4 times more costly than bulk. Soil purchased by the bag is about 4 or 5 times more costly than bulk. When shoveling heavy materials, using more small shovelfuls is easier on your body than using fewer but larger shovelfuls. Think about where you are hanging onto your shovel, the closer your hand is to the weight the easier the less effort it takes. Make sure to maintain good posture, minimize heavy work with bent over back, maximize use of your legs. Work at a good pace, do not dwell on how much you still need to move. Try to focus on how much material you already moved, how good it is going to look after your done and how much money you are saving by doing it yourself. What a great time to have friends, and family over! Below are some pile samples to give you an idea of how large piles are for a given quantity of material. The volume of a pile of soil, stone or mulch will be the same. However, a pile of Riverstone may look different from the pile of cedar mulch because it will likely be a lower, wider and longer pile because the round stones spread out farther when dumped. The sample piles show Tim who is 6’ tall and is holding a yardstick.